The months of November and December are my favorite time of year because it’s the holiday season. We have two major holidays coming up here in the States, Thanksgiving on November 26th and Christmas on December 25th. I’ve already started planning my Thanksgiving menu 2 weeks ago. I’ve started my Christmas list which includes decorations, dinner menus, cookie recipes and all things Christmas. Yes..I’m one of those! Mix cinnamon and sugar together ;set aside. Mix flour, salt and pumpkin pie spice and set aside. Heat pumpkin puree, butter, vanilla and water until it comes to a boil. Remove from heat and stir flour in quickly. Stir vigorously over low heat until mixture forms a ball. Remove from heat and beat eggs in one at a time by stirring quicky until well incorporated. Mixture should be smooth. Heat vegetable oil. Spoon mixture in a pastry or ziplock bag fitted with a star tip. Squeeze strips of dough into hot oil. Cook until golden brown, making sure to stir occassionally so that the churros doesn’t stick together. Drain, roll in cinnamon sugar. Serve warm. Oh my…that looks amazing. I have to try this. 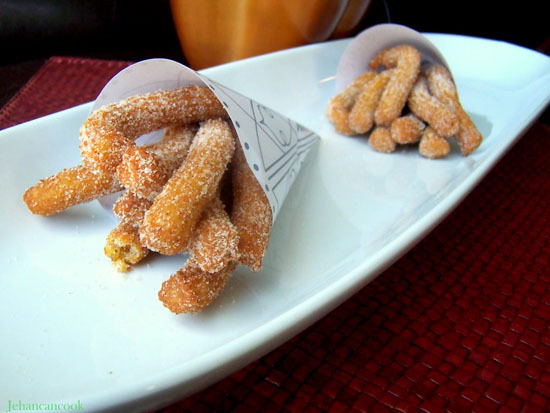 I am definetly going to have to try these, my son in law loves churros and he loves pumpkin pie, bet he will love these! these churros look amazing! I love churros in general but never had pumpkin ones. I must try these stat! 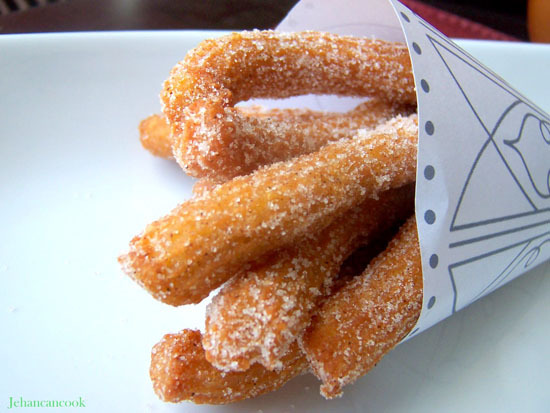 Making churros would be fun, especially a different variety like this. Brings in the flavors of the season. Yum, that’s something I’ve never tried before, pumpkin churros. This is a must-try recipe. Oh my, these are so creative and look soooo delicious!!! A pumpkin recipe that I haven’t seen yet this season! They look delicious! I’ve heard that Churros are the next Cupcake! And these look absolutely divine! These look fantastic! Great spin on the traditional, boring, predictable pumpkin pie. We’ve already celebrated Thanksgiving up here in Canada, plus I tend to be a little leery of anything that requires deep-frying… but I might have to make an exception for these because they look so delicious. Great idea. These sound delicious. I wonder if you could use these as a base for a take on tiramisu… in a big glass bowl these layered with mascarpone and drizzled with espresso or some type of liqueur might awfully nice. Amber that sounds lovely! I would omit the cinnamon sugar and go from there…hmmmm…maybe I can try that for my Thanksgiving Table! Wow! These look amazing. My son loves Churros and I love pumpkin, so I can’t wait to try these. Thanks!! Wonderful, I love Churros, but never tried one with pumpkin. Wish I can savour some now. thank you Cheah, I’m super excited about it! Jehan, these look like meh tai. Yummy. Thank you for this recipe. It turned out really well. I found your site after doing a search for pumpkin churros in Google. It was the perfect way to use a piece of pumpkin that’d been in my fridge for a while. I’m serving the churros with a caramel sauce. It’s the ideal dessert to combat these cold Sydney winter nights.